Featuring some of the most advanced rider-assist technology in the ATV world, the Grizzly 700 EPS has become popular with many different types of leisure riders and landowners who appreciate its high levels of comfort, as well as the ability to transport rider and cargo across extreme terrain where few other vehicles would dare to go. The Grizzly 700 EPS has been designed to build on the formidable strengths of the previous model while also offering improved style, performance and functionality. Featuring restyled bodywork as well as a more powerful engine, larger 26-inch wheels and even greater carrying capacity, the Grizzly 700 EPS offers even higher levels of class leading performance, comfort, style and functionality. The Grizzly 700 EPS gets a newly designed front grill, front carry bar and front carry bar cover that give it a unique and more aggressive look to complements its 'best in class' performance. New LED lights front and rear give this ATV a contemporary and sporty image, and the new V-shaped blow-moulded carry bar cover and 'eyebrow' style bodywork accentuate the new model's strong and purposeful face. Displacing 708cc with double overhead camshaft (DOHC), 4-valve cylinder head, gives increased running efficiency. Featuring a 44mm Mikuni fuel injection system, the engine delivers 9% more torque and 6% more power than the previous design, and the character of the increased power delivery is optimized so that the Grizzly 700 EPS is able to deliver smooth and strong performance across the rev range. The Grizzly 700 EPS is equipped with powerful LED headlights that give the best possible illumination together with high levels of efficiency and long service life. An important new feature is the fitment of a new halogen worklight that is located centrally in front of the handlebars. This central light not only gives additional illumination when riding by following the movements of the handlebars, and can be used as a worklight when stationary. Another significant improvement to be introduced on the Grizzly 700 EPS is the use of exclusive 26-inch Maxxis tyres. The advantage of the 26x10x12 rear tyres and 26x8x12 front tyres is that they provide optimum traction and durability, combined with high levels of comfort and steering precision for higher levels of handling performance and rider comfort. To match the aggressive and sporty new styling, the Grizzly 700 EPS is also equipped with newly designed front and rear racks that integrate with the new body panels. With a 50kg front load and 90kg rear load - up by a total of 10kg compared to the current model - the Grizzly 700 EPS enables recreational riders and utility users to carry up to 140kg safely and securely. The new model also benefits from the inclusion of three new storage compartments: two at the front and rear, as well as a new central storage compartment immediately in front of the rider. For class leading comfort the Grizzly 700 EPS features a plush new seat with an optimized seat height that enables the rider to move around for increased control and comfort. The front sides of the seat are 60mm longer, and the new seat also benefits from a redesigned mounting system that enables the rider to remove the seat quickly and easily when gaining access to maintenance items such as the air filter. To facilitate the fitment of the new easy-access air filter and centre storage compartment, the fuel tank on the Grizzly 700 EPS is relocated to a new position under the seat - whereas previously it was positioned further forwards and above the engine. Featuring the fuel filler on the right side rear fender, this 18-litre tank gives a good operating range. To give higher levels of riding comfort together with superior handling, the Grizzly 700 EPS is equipped with KYB nitrogen gas shocks at the front and rear. Giving increased stroke and running with revised damping settings as well as a softer initial stroke at the rear end, these shocks give 193mm front travel and 232mm rear travel. The shocks are also adjustable for preload, allowing the rider to tailor the settings to suit the prevailing terrain conditions or load. The Grizzly 700 EPS benefits from Yamaha's industry-leading Ultramatic® transmission that features High, Low, Reverse, Neutral and Park modes. Regarded as being the most durable CVT in the ATV world, the Yamaha Ultramatic® system incorporates a sprag clutch that gives a natural all-wheel engine braking feeling when decelerating or descending hills. The Ultramatic® system also delivers constant belt tension for smoother operation and increased durability and service life, and an integrated cooling fan ensures stable and consistent performance. 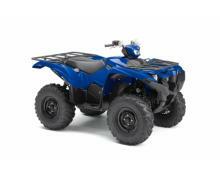 Another class-leading rider aid to be featured on the Grizzly 700 EPS is the On-Command® 4 wheel drive system. Using one button situated on the right side handlebar, the rider can quickly and easily select 2WD, 4WD or 4WD with diff lock, to suit the terrain. This high-tech push-button system delivers instantaneous drive, enabling the rider to switch seamlessly between different modes depending upon the circumstances. Wherever the Grizzly 700 EPS rider goes, they can be sure to have have access to all of the important machine running information via the new LCD multi-function instruments. Featuring a fuel gauge, speedometer, odometer, dual trip meters, hour meter, clock, 4WD/Diff Lock status, transmission gear selector and EPS warning light, the newly designed meter is located closer to the rider so that accurate machine status can be viewed quickly. For added convenience there is a 12V DC outlet to power accessories and devices. 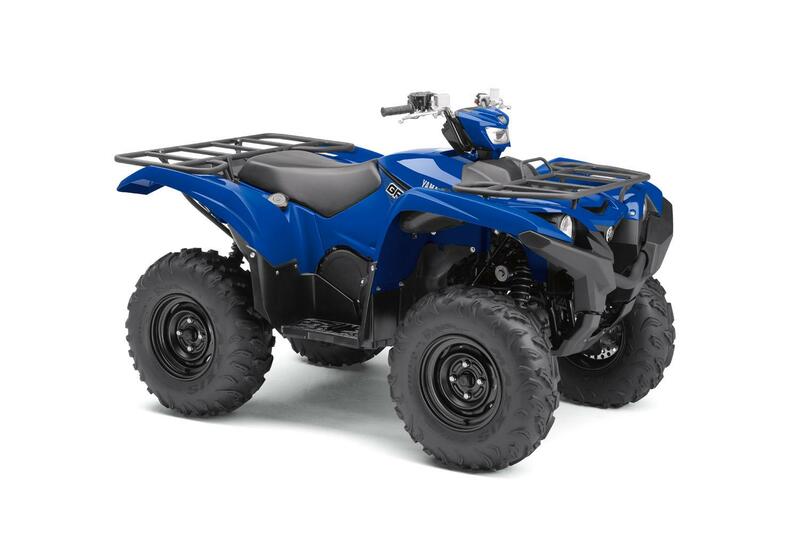 The Grizzly 700 EPS is equipped with the most advanced braking system in its class, and is the only big-bore ATV to feature front and rear disc brakes with twin-piston calipers. This industry-leading system provides strong and consistent braking power, and gives a high degree of feel with outstanding stopping performance through the bar mounted brake levers and the right side brake pedal. For increased versatility the Grizzly 700 EPS models are equipped as standard with a tow tab that is designed to accommodate a standard towing ball, while the Grizzly 700 SE EPS is fitted with a 2-inch receiver. With the ability to tow anything from camping gear through to supplies or tools - in addition to their 140kg total rack capacity - these go-anywhere, do-anything ATV models are amongst the most capable 4-wheel drive vehicles ever built. The Grizzly is equipped with durable new lightweight plastic skid plates that protect the underside at the front and rear. These skid plates benefit from recessed mounting points that give a smooth surface to minimise the chance of being snagged on rough and technical terrain, and this comprehensive full underbody protection system incorporates multiple engine and gearbox drain to facilitate routine maintenance.